This year’s housing market predictions bring good news for sellers – with the right price, they are in a prime position to move their homes at a profit as demand continues to exceed supply. And, just as they do every year, designers are keen to share their thoughts about what hot trends make homes beautiful inside and out in 2018. From colors and textures to wall art and ceiling nuances, here are a few trends in home décor worth noting. Color Reigns: Millennial pink will continue to be popular, but décor will give way to shades of lavender and lilac as a means to bring out beautiful, soft tones. Outside, the brightly colored front door is making a comeback. While red means welcome, vibrant hues of blue, pink and yellow are also quite inviting. Additionally, neutral and muted undertones of sage and other earthy shades are ideal for beach homes and spaces designed to be calming and peaceful. Contrast & Compare: High contrast palettes are a winner whether your home is on the shore or in the mountains. Choosing bold colors balanced with white can add finesse to a room without feeling overwhelming. Likewise, taking a tone-on-tone approach to trim work and walls makes the space feel interesting. Using the same colors with minor color accents on everything from walls to furniture brings a new twist to existing elements. Metallic Mix-up: Blending different types of metals can add flair to your kitchen, bedroom or bath. For example, try a stark white palette in a room mixed with unlacquered brass faucets and hardware and a beveled gold mirror. Shining bright for all to see! Ceilings Worth Seeing: These days, the most often ignored element in a room – the ceiling – is getting a lot more attention. From bold colors and patterns to textured wallpaper, ceilings are worth looking up to more than ever before. Pretty Potted Plants: Plants are not just good for improving the air quality or your mood, they can also be used as artful décor. Tropical plants with large leaves are ideal for an architectural inspired display, while plants with patterns are perfect for visual appeal. 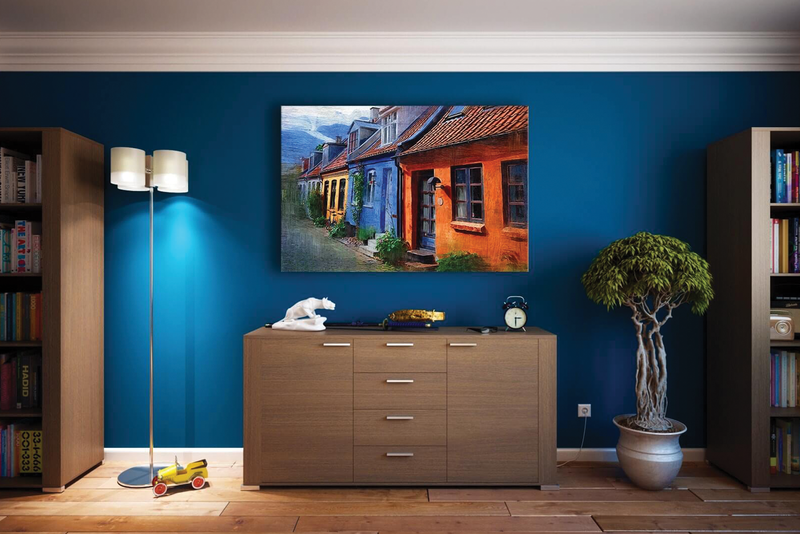 Statement of Art: If you’re looking ways to make a statement, showcase a big piece of art! For example, an abstract piece with bright hues can make jaws drop – and look phenomenal in a neutral space complete with other complementary bright colors. Perfect Patterns: Big, beautiful floral patterns are back, signaling the return of a more feminine side of home décor. Likewise, geometrics like circles have returned to the forefront and these shapes can be ideal for everything from accent pillows to wallpaper. Brass is Back: Days are numbered for brushed silver as golden brass tones return to the forefront of décor, bringing warm and subtle tones back into the home.